It has come to my attention that Mr. Kevin Little spoke for the Chamber of Commerce in favor of forming the RTA for Dane County. Is this truly the position of the Chamber? As a Business owner in Dane County I find it hard to believe the Chamber of Commerce would find another level of government bureaucracy and taxation good for business development and economic growth in Dane County. Supporting the establishment of another taxing body that is not directly accountable to the voters is just asking for problems and abuse. The level of taxation that this area and state already extract is excessive-- adding more is unneccesary and counter productive. The problem is not a lack of revenue it is a lack of discipline in how the funds have been spent on non-productive projects in the past. As proposed this new RTA will likely lead to spending on massive projects that will commit taxpayers to unending subsidies and endless tax burdens. As I see it, forming another government entity is just a way to take away the responsibility from elected county and local boards to give them insulation from the hard debates and taking stands on difficult issues. Since it is likely the majority of voters will not have access to, never or rarely use the proposed mass transit projects being considered I can see why the parties that want the RTA do not want it put to a binding referendum. If anyone truly believes that light rail can or will be economically viable then let private industry take it on. Or have we totally given up on free enterprise in this County? Please explain where the Chamber of Commerce's logic is if you support the RTA. The way government works, I do not want to see an RTA formed until it is voted on by the public. The trust in what will happen is not there if the RTA is formed first. It is a sad commentary when most of our elected officials cannot be trusted to do what the people want or what is best for the people instead of their own agenda. If the shoe fits I hope you at least realize it. I am a registered Democrat and a 20 year resident of Middleton. I want to go on record that I am opposed to the idea of building a commuter rail system for Dane County. I am opposed to the notion that appointing an RTA with the authority to impose any tax without a referendum from the entire voting public is illegal. The potential benefits do not outweigh the estimated costs of building, maintaining or operating such a system. The safety risks to the children who cross the tracks going to and from Elm Lawn concerns me greatly. The potential decrease in property values in the Meadows neighborhood is not something I look forward to. The unbudgeted costs of building a parking facility to accommodate any additional traffic in Middleton will be significant. The likely traffic backups on surface roads along the proposed route will increase pollution and could be a major hazard for safety vehicles. If this goes forward, I intend to do everything within my rights to oppose this and will ACTIVELY campaign against elected officials who support this idea. As my County Board Supervisor I believe it’s important you hear from me, a constituent, regarding my support, or rather lack of support for the new RTA and the impending costs associated with the formation of the RTA, the taxation that will occur and the modes of transportation the we all know this is about… Trains! My first point covers the very formation of the RTA itself. It’s formation has been forced upon the citizens of Dane County by the Governor, Kathleen Falk, Transport 2020 and now the word on the street is that the County Board sees this as a “rubber stamp” issue due to last week’s vote. However, when you consider that the RTA will actually be considered a separate governmental body with the right to increase the sales tax minimally .5% to 6%, action by the RTA will effectively amount to “Taxation without Representation”. I say this because the public had virtually no anecdotal say in the matter, and certainly no legal say in the formation of the RTA. You may remember that Governor Doyle “snuck” this into the recent budget; an action, I might add, I consider to be reprehensible! Now I know what your argument will be… “but it has to go before the public via a referendum!” However, not all of us are the rubes that the Governor, Ms. Falk, the RTA and other members of our government think we are. We are already seeing through the veiled attempt by many in power to say, “we are too busy to get this on the spring referendum so we’ll just have to wait until next November”; sighting the excuse that there is no time to get it on the spring ballot. However, the same group had no problem trying to ram this down our throats a year and a half ago; given only 9 day to do it! If you are concerned about being “green”, it’s hard to sell me on the fact that the train will be any kind of an environmental “savior”. Consider this… 9, 70-80 ton locomotives burning 1.25 gallons of diesel fuel per mile, 17 hours a day will be pumping grotesque amounts of exhaust into the atmosphere. In addition, with nearly 8000 traffic stops per day and the idling cars at each stop, pumping exhaust into the air, can you really tell me that this won’t leave an even bigger carbon footprint? In conclusion, I am asking… no begging that you do your homework, look at the data surrounding this issue of the RTA and the Commuter Rail and have the courage to say NO to the formation of the RTA (a taxing entity). If an RTA is to be formed, with the power that it will absolutely have, it needs to be done by a referendum, not by and through the selfish interests of our Governor, Ms. Falk or anyone else in or out of our county or state government. I would appreciate a response to this e-mail, by you, personally, to explain your position and why you would either support or oppose the RTA and the Commuter Rail. I respectfully request that you vote against forming the RTA at your upcoming meeting next week. This is coming at a time when people are being taxed out of their homes and we certainly can not afford a sales tax increase! If it were to increase bus service instead of a commuter train, I would be in favor of it. But we still need the referendum BEFORE the RTA is formed. It is also unfair to vote on this before you take it to the county voters via a referendum - clear and simple. It is definitely time that everyone really think about this instead of just going along with what the county executive and Madison mayor wish for. It's totally beyond what the majority of voters in Dane County want. In fact, people outside the city would have very little advantage with a commuter train. Bus service YES, train NO! Thank you for your time and consideration. Please listen to your constituents - your re-election could depend on it. I would like to state my case against the RTA and any sales tax increase to support the RTA. I request that you not even consider establishing this without first going to the voters of Dane County via a referendum. I am not against regional transit, but I am against a train going through the city of Madison and expecting the area towns and villages to pay for a train that will not benefit their areas. If we were assured that additional buses were being added to serve those areas, that is a different story. Supporting additional bus transportation is much more sensible and favorable. For five days this summer we had the great privilege of picking up our grandson each afternoon at 4:30 after his music clinic sessions at Mills Hall. From our west side home to Campus it took 45 minutes with all the traffic lights, construction and general traffic. Now add to that, the possibility of a commuter train interfering with the traffic, stopping and starting at each light, ambulances trying to get patients to the hospitals, all of which would be affected by the rail system, you have to reconsider this idea. What if it's your spouse, child or other loved one who might be in the ambulance, trying to get them to the hospital, having to wait for the train to pass - are the trains going to stop for flashing lights on emergency vehicles including the fire trucks? Have you considered the possibility of the lawsuits resulting from emergency vehicles unable to reach a hospital or fire because of the passing train? I have to say, this is not what I expect from the Dane County Board of Supervisors. You all are smarter than that and can figure it out. The first step should be a county wide referendum so the voters have their say. With people losing jobs, companies closing or reducing employees who will pay for this? Folks are already being taxed out of their homes. Let's not make it worse. Congratulations on all of your hard work! It is refreshing to see real people begin to stand up and begin to take responsibility for their right to speak up and be heard. For too long we have all been guilty of sitting on the sidelines and complaining about what is wrong and doing nothing about it. While the Transport 2020 people like to call attention to the "well thought out and well intentioned, but highly emotional comments" against the rail. They like to show off their intellect with charts, graphs and numbers that are supposed to have everyday people curl up in the fetal position and surrender in defeat. However last night. I heard a number of speakers skillfully and intellectually, along with humor and wit, poke so many holes in their presentation. I hope this is just the beginning of a new grassroots movement for the people of Madison and Dane County to once and for all stand up and be a voice against government, (national, state and local) out of control. In the haste to lay tracks and develop light rail in Madison , our city and county leaders point out the great systems now operating in Minneapolis and Portland . Note the population in these MSA (metropolitan statistical area) is 3.2 million (rank #16) and 2.1 million (rank #23) respectively. Madison is listed in the same table as 555,000 (rank #89). An effective regional bus system along with road enhancements (i.e. north beltline and 151 bypass to the interstate would do more for moving people and relieving congestion than a fixed track system. While Madison often thinks big (convention center and Overture) we need to realize the numbers just don’t justify nor support light rail. Madison is a small city with mass transportation addressed by a bus system. Let's improve upon what is already established and put this nonsense of light rail and the excessive taxpayer burden that would come with it to rest. In recent news stories we learned the Madison Transit and Parking Commission, an appointed group of citizens operation without oversight and accountability, decided to scuttle the plan to add 50 cents to Madison’s Metro Transit bus fare. Interesting, since these are the same politicians and newspaper that are pushing the formation of a regional transit authority (RTA) to “manage” transportation issues in Dane County. My concern is that citizens appointed to the RTA answer to no one and have no accountability to Dane County voters. They are free to make whatever decisions they choose, even if they are bad policy and a waste of taxpayer money. What better example is there of authority run amok than the mess at Metro Transit. Citizens need to speak out against the formation of the RTA. If they don’t, they swill see millions spent on the development of commuter rail that will not ease traffic problems, will have low ridership and will always run at a loss. I grew up in Chicago with my father being a streetcar conductor then a bus driver as the CTA abandoned rails, so I understand more about this than perhaps most people. With the layout of Madison and Dane county, I believe there will be nothing but a large scale failure, and a tremendous waste of taxpayer funds. Madison and Dane County have done NOTHING to provide decent cost effective transportation to the Dane County Regional airport in the 25 years I’ve lived in Madison . They can’t effectively manage the transit system currently operating where to go from the West side of Madison to the East side takes in excess of 3 hours, how are they going to manage anything larger in any sort of cost effective manner. I believe they should denied until such time as they manage what is existing in a positive manner which will probably occur around the year 3008. Please don't let this happen! I'm sick and tired of having the government tell me how I must live my life. Taxiing me for something I will never use is unfair. I don't want to see one dime of my money go toward this very bad idea. The issue here is more than having a” Cappuccino Express” and selling more New York Times. It is about the process in which the decision was made. It seems a small handful of people started with the conclusion of wanting a train, then worked backwards to justify that conclusion. The small minority WANT the “Cappuccino Express” while the vast majority feel there is no NEED for it, or like myself, feel process was an end run around the voters. Maybe if the process was done fairly, open, and with polls of a REAL cross section of voters, and not just the Monroe Street tif grocery store shoppers I would feel differently about this. Voters deserve to be made part of the process, not blindsided and railroaded by elected officials who forgot they work FOR the voters and not a predetermined political agenda. Thank you for adding the County Supervisors, and the candidates ,with their views on this to your website. I hope voters will find out about the listing, and get out and vote. After reading RTA Questions: Show Me the Money, Blown Budgets, No New Taxes! I felt the need to post this comment. If Dane County sales tax were to increase a 1/2 percent bring the total sales tax rate to 6% we would not get out of paying this sales tax if we were to go to another county, such as Rock or Jefferson, to purchase a car. The car dealer is required by law to collect the sales tax from the buyer based on the County in which the car will be kept. Basically that's when you will really notice how much this Commuter Rail is costing you. I understand that the state legislature will soon decide whether a Regional Transit Authority with taxing powers will be established in Dane County. In my opinion, the RTA for Dane Co. is an idea without merit. Wisconsin is already the highest taxed state in terms of percent of income paid in state and local taxes. Any additional taxes would probably tip the scales against many businesses locating or expanding here, just one example of its negative effects. The proposed passenger rail service is unneeded, too expensive, and totally unsuited to an area of our population size. If efficient, low cost, environmentally friendly transportation is needed, why not look at the obvious answer? Express busses that run on an expanded highway system (North Beltline) with peripheral "park & ride" locations would serve us better. In addition, if the original bus plan proves not to be ideal, it can be reconfigured much more easily and at much less cost. Please vote against the Dane County RTA. I have been loosely covering the Madison RTA situation and I am appalled that this is being represented as having “overwhelming support”. I do not support ANY tax dollars be spent on a rail / trolley transit system, or further study of this system. I want the Transport 2020 Committee to recognize and acknowledge the public’s opposition to the train and trolley proposal and to communicate our opposition in the application to the Federal Transit Administration. The idea of an "RTA" should be on the April 1st '08 ballot as a referendum to find out if there is general support for "regional public transportation"!!!!! The public should have the option to vote on something this costly and restraining. Before the legislature even considers anything about it!! Before implementing any additional transportation options beyond state sponsored "Car Pools" or "Vans," it would seem logical to check to see how many riders are using these for transportation. Buses should be the next step, but only when the "Vans" are so full they have to be enlarged to carry everyone. LET THE PEOPLE HAVE THE REFERENDUM ON 4/1/2008!! On January 10th, the Dane County Board's Executive Committee considered a resolution, authored by several non-Madison county supervisors, to place an advisory referendum question on the April 1, 2008 election ballot. This resolution would have authorized a countywide vote on creating a Dane County Regional Transit Authority or RTA prior to enactment of state legislation providing counties with the authority to establish such an RTA. An advisory referendum would involve all taxpayers, by their vote, to be full partners in deciding if a new taxing authority, like the RTA, was necessary. The call for such an advisory referendum comes from the fact that the voters and elected leaders of the towns, villages, and cities outside of Madison were excluded from the planning and development of the current RTA proposal. The results of an advisory referendum, which I believe would be overwhelmingly against the current Madison based proposal, would be a way for the taxpayers, as a whole, to lobby our state legislators during their deliberative process. Such a lobbying effort on the part of the taxpayers of Dane County is necessary to counter the pro- rail Madison activists and high priced lobbyists working to convince the state legislature of the need to create these new taxing transit authorities. Unfortunately for the taxpayers, this countywide referendum will not take place. The majority of the County Board's Executive Committee, dominated by Progressive Dane Party county supervisors from the isthmus and their followers, decided to allow a referendum only after the legislature completes its work on this issue. Could someone at this meeting have stood up for the county taxpayers in general and the voters of the 30th district in particular? Yes, for our own County Supervisor Pat Downing was at this very meeting. But what did he say or do, you might ask, on behalf of his constituents in an effort to keep this process open? NOTHING!! For as a supporter of the the Progressive Dane Party's agenda and a member of the county board's majority, he would never step out of line to stand up for something as trivial as the right of the voters in this county, or in particular, his district, to have a say in the largest potential tax increase in the county's history and the biggest capital investment ever to be made by this county if this far flung transit proposal were to become reality. Mr. Downing's tacit approval decries the open government needed in a decision making process of this magnitude and shows his obvious disdain of those he supposedly represents. As a mechanical engineer for a reputable Architectural and Engineering Firm in Madison Wisconsin, and having lived in or around Madison my entire life, I felt compelled to take a look into this proposed rail system. I printed off the primary route proposed by Transport 2020. Knowing Madison like I do I identified 9 conflict areas that will create extensive traffic back-ups if this line gets utilized. I also identified a stretch of the corridor where to expand to 2-3 lane rail system will probably require the demolition of buildings or at least their support parking lots. Does anyone else see a problem with this? And lastly. There is no mention in the Transportation 2020 plan for “waiting stations” in their plan either. They address how the busses can be used to assist the rail, but make no mention of waiting stations for trolley riders. Given the extreme temperatures that we get in Wisconsin, it seems unwise to suggest a mass transit system that does not allow people to wait in some type of comfort. Many will argue that the bus stops are not heated or cooled, but most bus stops are within a block of an individual’s home and you can time your walk to a bus route accordingly. Expecting people to wait along a route during the middle of rush hour is irresponsible at best. Now perhaps Transport 2020 has considered this but does not want to include these costs and land issues into their “initial start up cost”. But it is my knowledge in the construction world that bad news does not get better with time. To try and get the tax payers to buy off on this, then surprise them with these added “required” items only AFTER they have been locked into a ADDITIONAL taxing source in order to pay for it seems like dirty politics at it’s finest. There is also the cost of all the additional State employees that will be added to the YEARLY operating cost of this. The Governor is already trying to raise taxes to help plug the holes in the transportation budget (some of which he made), it does not seem prudent to add an ADDITIONAL transportation system to that budget that everyone knows will need to be subsidized by the state. Thank you for taking the time to hear my opinion on this matter. And it is my hope that this proposal for the trolley (and the RTA) get dropped for the bad ideas that I feel they are. The people of Dane County reject the Regional Transportation Authority. That’s why the County Executive will not hold a referendum until after she gets the taxing authority - she knows it won’t pass. What are the details of the proposal? County Executive Falk says “trust us, we will work those details out”, after she gets her hands on our money. Reducing congestion is not the goal of the commuter rail line. This is the ‘fact’ that I love the most. David Trowbridge, project director of Transport 2020, which endorses the RTA, told me “the Commuter Rail line is not designed to reduce congestion”. He told me it was “to give people options”. I thought this was about traffic congestion; nope it’s about options. If so, roads are the option that over 90% of commuters choose, and they benefit all of us. Roads and expanded bus service are not part of the RTA. Chicago started building the “L” in 1892, when the population was 1.1 million people. When Madison’s population reaches 1.1 million we can begin this conversation again. Until then, build the North Mendota Parkway, fill in the potholes and pull the weeds in the medians. 1. The City of Madison's inability to manage their resources, such as the ongoing deficit from the mistake on the lake (Monona Terrace), the cost overruns on a pool facility which was not built within budget and had to closed during the middle of the week due in part to excessive salaries, and a school board which for the 25 years that I am aware of has never stayed within their budget while outspending the rest of the state in per pupil costs, without showing any difference in academic achievement because of the excessive costs. A water department which put peoples' lives in danger routinely by a man that the mayor wanted to retain with a raise included. A mayor who appointed Bill Clingan to Economic Development even though he has NO expertise in that field, or in other words, give your buddy a job. The Overture Center 's management has the potential for financial disaster because of their mis-management of the Endowment Fund, with it's past director facing federal charges on more than 30 counts. A city council that can't agree to 30 new police officers even after all the listening sessions around the city with citizens demanding a major adjustment to police staffing. 2. A county board chaired by Kathleen Falk which got a 1/2 % sales tax in 1991 to build the jail which is undersized, and being supported in part on an estimated receipt of more than $80,000 from the ICS phone contract which places an unnecessary burden on a segment of society that in general can least afford it, a court house which was built with inadequate doors for security of the jurists. Where is the $43 million dollars plus being wasted now? 3. The Alliant Energy Center which has gone from being self supporting to another financial drain to taxpayers. A regional airport with NO transportation available to arriving passengers other than a taxi. 4. We have the Madison Bus System which is grossly under utilized, and one can can look at almost any time of the day and see less than six people on a bus. Kathleen Falk wants to adjust this so instead of provide the transportation that it does, it would be stripped to force people to take the train, and subsequently take longer to get anywhere. 5. There has been no plan put forward to my knowledge on how the governing board would be made up. Would they be appointed by the Mayor of Madison and the Chairperson of the Dane County Board? Accountable to whom? There are a great deal of different needs within a finite amount of money/taxes that we taxpayers can afford. This was vividly demonstrated by the recently completed state budget. There are things we need, but this is NOT one of them. Please stop the stupidity from happening. Thank you very much for your time. You are my state legislators. I wish to express my opposition to the formation of the pending Regional Transportation Authority in Dane county. I am asking both of you, at the state level, to oppose the formation of this taxing entity. Thank you for your attention. 3. I drive from Brooklyn to Middleton for work each day; it takes approx. 35 minutes including the daily congestion on the Beltline. Time is very valuable to me and my family, and adding say 30 minutes to each trip there and home on a train is an added hour of each day I'm not with my family. NOT acceptable. 2. Commuter trains could run from my doorstep to the front door at work, and I would still drive my car because of personal and business needs that require me to be in certain places at certain times that are not predictable. Automobiles=practicality. 1. 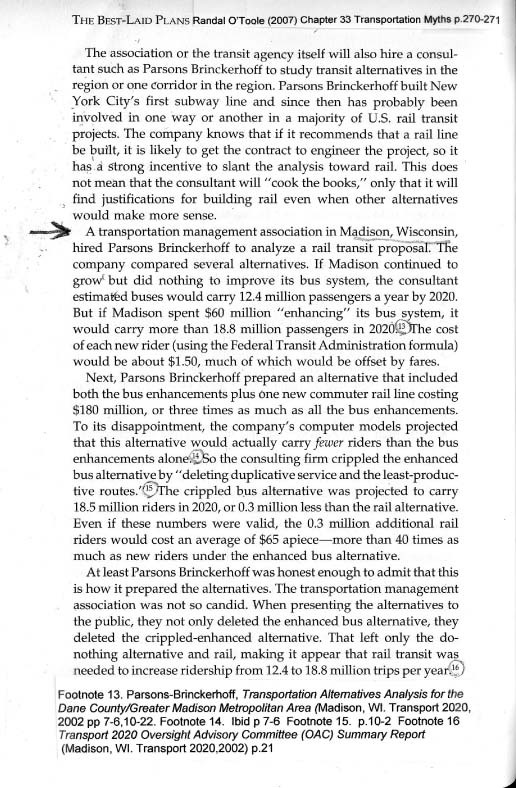 The immeasurable cost of a train system in Madison that few would use is preposterus; we KNOW people use cars, so let's shift focus from pie in the sky commuter rail to alleviating congestion by being smart about building roads (e.g. north beltline, 151 bypass, etc...), and increasing bus use for those who want public transportation. Any solutions will require vast amounts of money; let's knock the non-solution off the table before it's forcefed to us!! - I don't see that the transportation conditions in Dane county are so bad that an entity such as a RTA is needed. Changes in transportation occur when too many people are killed by a given means of transit: highway 12 to Sauk City and improvements to Highwasy 151. - Regardless of the purpose, creating another taxing entity in today's political climate will provide the politicians with more temptation. Any pool of money with an intended purpose is getting diverted for some other purpose. Tobacco money raided by McCallum. Transportaion money raided by Doyle. This RTA will likely be the same. 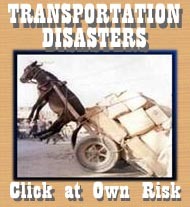 - Those in favor of a RTA cite transportation in larger American cities or Europe. In general, the population density of the US is too low to justify a European style system. More specifically, there aren't enough people in Dane county and surrounding counties to justify a European style system. - If there has to be some system established, those in favor should start their own organization and generate their own funds from private and/or public sources and operate a transit system at a private level.